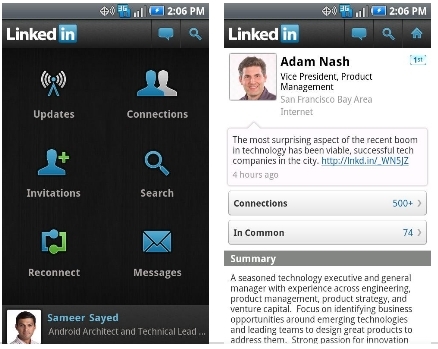 LinkedIn for Android app provides users with a quicker response and more features; basically the complete mobile experience for professional networkers.you can walk into any interview, any customer engagement or client meeting with the ability to look up the details on over 100 million professionals worldwide, in real-time. View and share crucial business intelligence and updates with your network. Perfect for those spare moments between meetings. Search across over 100 million global professionals, and get the answer back in seconds. We’ve implemented a unified search across both your direct connections and the entire LinkedIn network. LinkedIn is your address book in the cloud. Get quick access to any of your connections to get their up-to-date profile information, and the ability to send them a message immediately. Why wait to get back to your desk? Accept outstanding invitations immediately. Messaging is one of the reasons that Android owners love their devices, and we’ve worked hard to integrate your LinkedIn Inbox. You can’t leverage your network if you don’t build it. This module brings suggestions for new connections to you anytime. Now you can build your network from anywhere, in seconds.